Note: Passenger & freight; exact model of the NORTHERN QUEEN. Charles A. Farrer, et al, Meaford, ONT. 15", 27" x 24" engine, 300hp, 98rpm, by Doty Engine Works, Toronto, ONT, 1888. 8' x 13' scotch boiler, 123# steam. 1941, May 3 Registry closed, "vessel broken up, dismantled. 1889, Jun 1 Registered Owen Sound, ONT. 1893 Wheel broken on rock near AuBarrie, remained 3 days until taken to Owen Sound for repairs. 1894 Owned North Shore Navigation Co., Collingwood, ONT. 1900, Oct 9 Burned at Collingwood dock, fire started in boiler rooom; owned by North Shore Navigation Co., Collingwood. 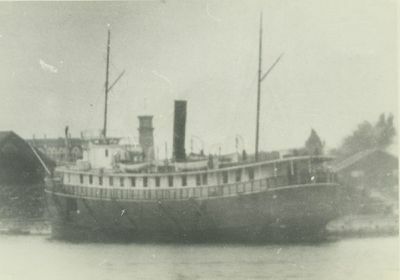 1906 Rebuilt as a tug by Robert J. Morill, renamed A.F. BOWMAN, C116385, 76' x 22' x 12', 113 gross tons, 18", 36" X 26" fore & aft compound engine by Doty Engine Works, Toronto, ONT, 1889. 1906, Oct 24 Registered Port Arthur, ONT; owned Canadian Towing & Wrecking Co., (James Whalen). 1929, Jan 8 Sold to Dominion Towing & Salvage Co.
1929, Apr 11 Registered Montreal, QUE, but remained at Port Arthur.